Your one stop source of news from Marshall Texas and around East Texas. For more information or to get all the news, visit Lone Star Eagle News.com today! As the world turns to social media and IPhones, the success of your use of social media can only be verified when measured against five key metrics important to determining success or failure. Theres been a lot of talk about social media lately. It is Addictive. Fun. Downright social! But how valuable is it? How do you tell? There are dozens of measuring tools online to tally up any and all countable social media elements. Most of them are interesting and some actually useful. Here are five key measurements or metrics that might prove useful to the you, the manager of your office communication. Your center may have a website. Maybe you have embraced Facebook or Twitter. Some of you have posted videos on YouTube.com. Others have mounted an Email campaign using Constant Contact or AWebber. 1. Did they get the chance to connect with your center? 2. Did they get the message? 3. Did they repeat/retweet it? 4. Did they get a good feeling about it enough to read your message? 5. Did they complete your call to action? As you write your copy, will it communicate in such a manner as to invoke action at some level in your viewing audience. At Google, every product is developed around the idea that every action can be measured. 1. Did they get the chance to connect with your business? If you put up a billboard on the highway, so many thousand commuters have an "opportunity to see" your message -- unless they were texting, applying makeup, tuning the radio, disciplining their kids or, heaven forbid, watching traffic. But, the measure of success is not how many eyeballs saw the billboard, but how many phone calls or office visits did it result in? If you put an ad on TV, it is likely many thousands, even millions of viewers will have an "opportunity to see" your message. That is unless they were fast-forwarding, texting, applying makeup, tuning the radio, disciplining their kids or, most likely, answering nature's call or on the phone. Likewise, if you invest in TV you are interested in how many people respond to that ad. You are looking for a measurable factor or “metric” by which you can judge success vs.failure. Now, when you post a message online, it is expected that some unknown number of people will have the opportunity to see it if -- they have already subscribed, befriended or followed you or know somebody who did. The sizzling diamond of what social networking can bring to your center is that they might only have known somebody who knew somebody who knew somebody .. who most likely will see or view your message. So this is your first metric: the base number of people who are in a position to get a message from you directly. At AWS CREATIVE SOLUTIONS LLC, I measure our counter, our stats but even more our Google Analytics to really see where my sites are having its greatest results. Your RRS readers, newsletter subscribers, Web site visitors all count for this metric. Throw them all into the stew for this metric. These are the ones to whom you are directly connected. 2. Did they get the message? Because your viewers and visitors are otherwise engaged means accurate measuring of their response to your message is fairly incalculable unless you trust people to tell you the truth when you interview them. "Do you read all my Tweets?" is more than likely to produce 100% positive result. There is a reason Facebook does not tell you when people unfriend you. At least with email, you can get a rough number of opens, but with Twitter, you may as well put your finger up in the air and feel the breeze. So there has to be a way to measure such social media success. 3. Did they like your message enough to repeat or retweet it? Lots of tools are out there to help you monitor what pearls of your wisdom others deem worthy of retweeting. Between Tweetbeep, trackbacks and Google Alerts, you'll be able to maintain your vigilant brand-spread watch. Another great tool is HootSuite.com and Twitterfeed for IPHONE. With these tools you can know when someone retweets or direct messages you. The key is to write content that is so easy to read that it makes them want to repeat it to their friends. But suddenly, it gets trickier. Did they get your message from others who got it from others? If you're Susan Boyle, they got the message, but this is where you feel the urge to map out the connections and figure out who are the real influentials. This is not as easy as it may seem. Certain specialized tools like Sentinal Visualizer claim o answer questions like: How highly connected is an entity within a network? What is an entity's overall importance in a network? How central is an entity within a network? How does information flow within a network? What does it mean to your success? Influence becomes the prime mover in the worlds of online virality. Knowing who can lengthen your reach helps you determine what your message should look like. 4. Did they get a good feeling about your message? Sentiment analysis is a different kettle of fish. In Hollywood, Oscar Wilde is right, the only thing worse than people talking about you is people not talking about you. In Hollywood, there's no such thing as bad press. In business, that they are talking is good only if what they are saying is good. As so, another category of social media tools pops up like BuzzLogic, JD Power WebIntelligence and ScoutLabs. The important thing about sentiment analysis is that it is a more direct window into the hearts and minds of the marketplace. It is the actual pulse of opinion -- whether it's about your brand, your industry or your latest viral video. This is market research at its best. 5. Did they complete your CALL-TO-ACTION? If you were trying to sell something: did they get out their wallets? If you were trying to get them to buy a product, did they complete the sale? If you were trying to improve customer rating of your business or brand, did the numbers change after the campaign? If you were trying to boost customer inquires, did they call your office? Finally, we get to the measurement at the end of the equation. We want to improve all of the above in order to move the needle on the bottom line. Let's not forget that in the end, it is about making new sales, customers or buyers. And let's not forget that below the bottom line, there is the key metric we must never overlook: Did our message tell the truth? Did it represent your center or business in a positive light? Did it help solve a problem or encourage someone? Everything you do whether it is working with a someone in person or on the telephone or online, your job is to be a representative of positive marketing at all times. Embrace and enjoy social media marketing. Take charge of the results to insure that you are not simply spinning your wheels. Ask about our social media marketing starter program. For one low cost, you can have your social media network established, your staff trained how to feed the network quickly, efficiently, and legally, Our service provides the setup, layout, configuring of a Twitter, FaceBook, LinkedIn, and Blog to accompany your existing website. A customer feedback and email campaign management system as well as a Google analytics and Hootsuite account will be established on your behalf. And more than all this, creative copy will be written to establish your network with a concentric message tailored to your existing current marketing or advertising. As you view this social media map, you see that there are many sources that make up the many dimensions of social media marketing. The key is to have the means to measure the success of the network you use to accomplish the desired call-to-actions found on your network. The conversation map below is a living, breathing representation of Social Media. This map will evolve as services and conversation channels emerge, fuse, and dissipate. As a communications or service professional, you'll find yourself at the center of the prism - whether you're observing, listening or participating. Brian Solis, of PR 2.0, worked with Jesse Thomas to create the "Social Media Conversation" map. This visual map is the ideal complement to The Essential Guide to Social Media* and the Social Media Manifesto** Both will help you better understand how to listen and in turn, participate transparently, sincerely, and effectively. As conversations are increasingly distributed, everything hinges on listening and observing. These two fundamental actions on your part, will help you identify exactly where relevant discussions are taking place, as well as their scale and frequency. This dialog can be charted into a targeted social map that's unique to your marketing effort. You can reach Ken Freeman at 214-703-0505 or email: support@awebstore.com to learn more about social media marketing helps and services available. Now, sort through these five key steps and use them to grow your outreach to a higher success rate. SHARE THIS REPORT with at least three others you know. CHANGE is possible. *This free ebook by Brian Solis, San Francisco, CA, United States http://en.wikipedia.org/wiki/Brian_Solis contains a great explanation of how to start down the Social Media path. ** Download your own copy of this free report here. Listen to the discussion of AWS CREATIVE SOLUTIONS LLC Ken Freeman and COVENANT DESIGNS Mark Kaiser. MARSHALL, TX – The Marshall Chamber of Commerce proudly presented 20 Leadership Marshall 2009 participants at a graduation ceremony held on Thursday evening, August 20, 2009 at OS2 Restaurant & Pub' s ballroom in historic downtown Marshall. Chamber Board Chairman, George Carter, gave a warm welcome to the graduates and guests, which numbered nearly 70 people in attendance – the highest number in attendance on record. Chamber President and CEO, Connie Ware, introduced keynote speaker, Representative Bryan Hughes, Texas House of Representatives. Representative Hughes presented a compelling address on being a servant and a leader. Hughes is known for demonstrating these exemplary characteristics in his personal life and in the House. Leadership participant Debbie Lucas of Brownrigg Insurance Agency gave an invocation and class remarks were given by Louraiseal McDonald, Harrison County Extension Agent. She was assisted by Marco and Orlando Valle who presented facilitator Keli Talbert with The Most Inspirational Leader Award. Guy Barr of Marshall Christian Academy, alumni of Leadership Marshall, provided a stirring and inspirational message of commitment and responsibility. A slideshow presentation played throughout the program and highlighted the last six months of group activities by the Leadership Marshall 2009 class and the many business and civic leaders they met in the community along the way. Sponsored by the Marshall Chamber of Commerce, Leadership Marshall began in 1991 and continues with success bringing leaders and potential leaders into contact with the many facets of the Marshall area to provide a close business network. The program focuses on education, health care, business and industry, quality of life and tourism, city and county government and a ROPES course at Camp Fern and ETBU. It concludes with a graduation banquet and awards ceremony. Most every participant will agree that the program puts you in touch with every facet of the community in a personal way. You walk away knowing where and who to call when the program ends. The friendships and partnerships you build along the way enhance the leadership experience. Everyone was sad to see it end so soon. However, hopefully, they will take with them what they learned during the six-month course and utilize it to become better employees, better volunteers, and better citizens. Many of them are already demonstrating just that. Suzon Tropaz Holmes identified the need of microscopes for the science classroom at Trinity Episcopal School and to everyone's surprise, ordered microscopes and had them shipped to the school. Orlando Valle is now serving as a Knight of Columbus. Marco Valle strengthened his commitment to Marshall, making the decision to stay in Marshall in order to serve this community. He also joined the Chamber Ambassador program. Juan Diaz also became a Chamber Ambassador. Marco, Orlando and Juan are also a part of the Chamber's Hispanic Business Alliance under the direction of Keli Talbert. Courtney Smith delivered the keynote address at Wiley's Leadership Conference and is pursuing a degree in criminal justice at Wiley. Gareth Juays seized the opportunity to ride along with the Marshall Police Department so that he could learn and more fully appreciate all our officers do. Nominations are already being received for the Leadership Marshall 2010 classes set to begin next March. For more information, contact the Chamber at (903) 935-7868. We unapologetically raise money and awareness for cancer, heart disease, diabetes and more... Why not do the same for a cause that kills more than all three combined: abortion? Together, we CAN make difference!!! Who: Everyone is welcome. Bring the kids, your neighbors, your neighbors kids (if you dare) the family dog... the list could go on and on. 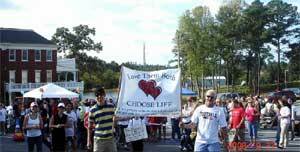 What: Walk for Life is a leisurely two-mile walk, so you don't have to be in great shape to participate. There is no entry fee either. Many walkers will be walking as sponsored walkers, but we'd love for you to join us no matter. We'll be giving out free t-shirts this year and goody bags with a coupon for a free Chick-fil-A chicken sandwich while supplies last. Water will be passed out at the one mile mark, and we'll have free chiropractic exams for the adults and a balloon clown and face painting for the little ones. When: Registration will begin at 9:30 a.m., and the walk will start promptly at 10:00... with a prayer first, of course. Where: The walk will begin and end in the parking lot of Dallas First Baptist Church in downtown Dallas. Why: As Christ followers, we're called to stand up for the rights of the oppressed and against the spilling of innocent blood. Who is more innocent than the smallest of God's image-bearers, the unborn? In walking together for life, we are not only standing against abortion, we are connecting a problem to a solution. We're saying, "There is a grave, moral atrocity happening among us, and we're not going to sit by and let it continue on our watch. We are part of the solution." MARSHALL, TX, September 14, 2009 – The Marshall Chamber of Commerce is set to honor law enforcement and firefighters at their annual Appreciation Dinner on Tuesday, September 22, 2009 with the lines opening at 5:30 PM and the program beginning at 6:30PM at the Marshall Civic Center on Highway 59. “This event is designed to bring the community together to show the deep appreciation in the form of a meaningful awards ceremony for our brave officers and volunteers who serve us without question,” shared Connie Ware, President and CEO of the Marshall Chamber of Commerce. Caddo Parish Sheriff Stephen W. Prator is slated as the guest speaker for the evening. Sheriff Prator formerly served as Chief of Police in Shreveport, Louisiana before becoming Sheriff of Caddo Parish. Prator made a name for himself after deploying innovative and effective law enforcement techniques and is highly respected in his field and in the community. Last year’s response was overwhelming with more than 600 individuals at the banquet. The Chamber is hoping to rally a large response again this year to show overwhelming support for area law enforcement and firefighter personnel, and volunteers for the incredible work they do that affects the quality of our lives every day – putting their lives on the line to serve and protect others. “The community’s generosity enabled us to present cash awards to the recipients, confirming the community’s appreciation for the service of our law enforcement and fire fighting personnel,” said Ms. Ware. Two complimentary tickets are included with each $50 donation, if requested. Law enforcement and firefighter personnel plus one guest each may attend free of charge. Public tickets are on sale now for $13 each. Reservations are required and dinner will be catered by Catfish Express. For more information about becoming a sponsor or to purchase tickets, please contact the Marshall Chamber of Commerce at 903-935-7868 or visit the Chamber at 213 W. Austin.